Last month, I was diligent about my research. I read a lot, but it was almost entirely a fact seeking mission, and quite frankly, it was exhausting. Don’t get me wrong – the books were incredible, and I’m so glad I took the time to read and take notes from them, but I also wish I hadn’t put so much off to the last minute that I was forced into such a rigorous schedule. As it is, we still have plenty to do before this baby arrives, and I don’t have much energy for anything – even reading delicious fiction – but I did find a book (at the beautiful new library that opened a couple of months ago right down the street – am I excited about this? Yes!) that was prefect for all the evenings I was sitting in a line of cars waiting to pick my husband up from the train. Mallory Ortberg, in case you don’t know, is the co-editor of an amazing website called The Toast. 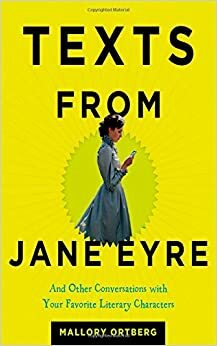 Her book, Texts from Jane Eyre, is ridiculous and honestly way more brilliant than it has any right to be. I felt downright stupid trying to parse some of the texts because I’m clearly not as well read on some of the classics as I should be. She, on the other hand, has the kind of inside scoop on quality literature that will make English majors weep with joy. It’s also the perfect book to keep on hand for those three to five minute intervals of downtime we seem to now use exclusively for checking Instagram, Twitter, email, or, of course, texting our own brilliant thoughts to loved ones and frenemies alike. While the very best long term solutions would probably involve spending more time in the garden, or somehow discovering a way to collect all those brief breaks and turning them into an hour on the couch with a superb novel, having Ortberg’s wonderful sense of humor to keep me company has been a wonderfully workable option. Her book pinpoints that oft-overlooked intersection between pop culture and literary prowess. I feel, in equal parts, that I would happily watch her do standup as I would be in awe of her lectures in a college classroom. Her intelligence is also intimidating to me in the best kind of way; it makes me want to reach out and learn from her because I trust that her sense of the absurd would make the experience utterly delightful. This is probably not a book that would strike the same chords for everyone as it does for me. It skews toward a younger audience in its conceit, but an older one in its depth – an interesting combination, and one I hope might encourage interesting conversations about theme and communication between those two groups. Literature is an ever evolving field, and although some elements will always remain at its root, our drive as curious, boundary-challenging humans will also push and stretch it into new shapes in every generation. It’s one of the most beautiful things about books and about studying trends and history of reading habits. We’re always seeking to do what Ortberg has – take the best of the old and transform it into something fresh, fun, and new. For more about Mallory Ortberg, go here. I want to find this one to read, it looks fun and ‘bookish’. It depends on what you’re looking for in a book, but I enjoyed it both for its novelty and cleverness! I think this is a pretty cool concept. love this one. It’s a winner cause Jane Eyre. Right. It caught my interest that someone can be intimidating in a good way. I’ll be taking a look at this book!